Some time around their first birthday, children begin to engage in 'triadic' interactions, i.e. interactions with adults that turn specifically on both child and adult jointly attending to an object in their surroundings. Recognized as a developmental milestone amongst psychologists for some time, joint attention has recently also started to attract the attention of philosophers. This volume brings together, for the first time, psychological and philosophical perspectives on the nature and significance of joint attention. 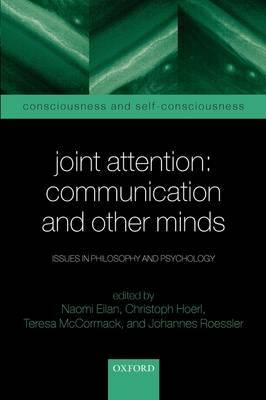 Original contributions by leading researchers in both disciplines explore the idea that joint attention has a key foundational role to play in the emergence of communicative abilities, psychological understanding, and, possibly, in the very capacity for objective thought.